Victor-based REDCOM Laboratories, Inc. was recognized by NYS Senator Rich Funke for its entrepreneurial spirit and commitment to doing business in the Rochester community. “We’re excited to introduce REDCOM to our local community. REDCOM is one of Rochester’s best-kept secrets. Since 1978, we’ve been building specialized communications products that solve the unique challenges of customers that span the globe. 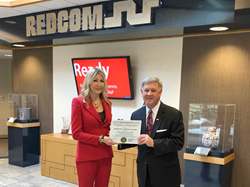 REDCOM Laboratories, Inc., a leading supplier of the world’s most secure and reliable communications solutions, is pleased to announce that the company is being profiled as New York State Senator Rich Funke’s Business of the Month. The video profile is available on Rich Funke's YouTube channel. REDCOM Laboratories, Inc. is a woman-owned small business that specializes in the development of advanced communications solutions with a focus on security, reliability, and interoperability. Located in Victor, New York, REDCOM’s global customer base includes commercial telecom carriers, private networks, integrators, and government and defense agencies. For additional information, please visit the REDCOM website at http://www.redcom.com.